The electric piano was invented by Harold Rhodes (1910-2000) during the forties when he was in the army. The first instruments he built were made of aircraft pieces and were intended to entertain army servicemen. The electric piano as we know it today grew out of a partnership between Harold Rhodes and Leo Fender who released a 32-note version of the instrument. But it is not until 1965, after the takeover of Fender by CBS, that the instrument really came to life when a 73-note model was released. From then different models were introduced including the Mark series as well as the two 88-note Suitcase and Stage models until 1984 when production ceased. Harold Rhodes was not the only one to work on the electric piano. In the thirties, the inventor Ben Meissner had developed an electrostatic pickup design he used to amplify a conventional upright piano. The Wurlitzer company became interested in this idea but replaced the piano strings by metal reeds. In 1955, the EP-100 piano was released and followed by many other models until 1982. The electric piano, with its distinctive sound, has marked the history or rock and jazz in the sixties and seventies. It has been popularised in thousands of songs by legendary musicians and bands such as Ray Charles, Joe Zawinul, Herbie Hancock, Chick Corea, Stevie Wonder, Steely Dan, Supertramp and many others. In the recent years, the electric piano has enjoyed a resurgence through its extensive use in rock, jazz, fusion, hip hop, R&B, and house. The mechanism of an electric piano is relatively simple. A note played on the keyboard releases a damper and activates a felt-tipped hammer which hits a metal bar having the shape of a tuning fork. The struck portion of the fork is called the tine and is made of stiff steel wire. 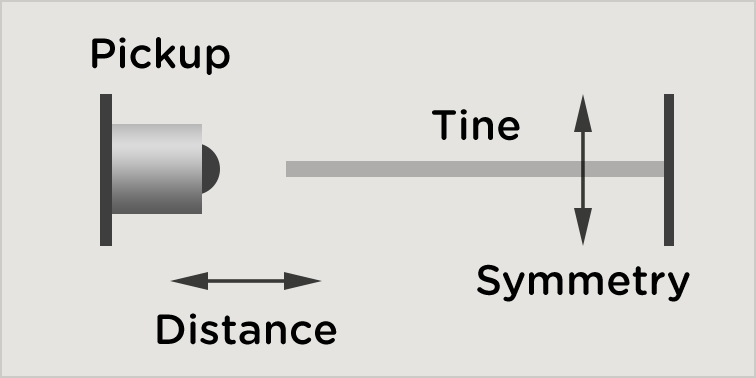 The other part of the fork, parallel to the tine, is called the tonebar. It acts as a resonator adding sustain to the sound. The vibrations of the tine bar are picked up by an electromagnetic pickup and sent to an amplifier, very much like in an electric guitar. The result is a very expressive instrument with a characteristic smooth tone which can also be made to growl or bark when played harder and the pickups introduce nonlinear distortion. The functionning of a reed-based piano is very similar except that instead of a fork, the hammer hits a metal reed. The reeds are placed near metal plates which together with the metal reeds form an electrostatic or capacitive pickup system. Compared to tine-based pianos, reed-based pianos are known to have a brighter and more hollow sound. The core of the Lounge Lizard engine is based around the components of a real electric piano: the hammer, the fork, the damper and the pickup. All these elements have been carefully modelled in order to allow for a very accurate reproduction of the tone and dynamics of electric pianos resulting in an authentic recreation of their action and feel. The engine also includes an EQ to shape the tone and an adjustable stereo tremolo, effects that were built-in with specific piano models. Electric pianos provided adjustment for pitch, timbre, and volume. On the original instruments, the tine is fitted with a spring which can be moved along its length for fine-tuning. The tone and volume can also be adjusted by changing the position of the tine in relation to the pickups. Tuning a reed-based piano is even more delicate. On the tip of each reed is a lump of solder whose size and shape alter both the pitch and the tone of the note. These adjustments were at the heart of the electric piano's character as they control the harmonic content, attack, and decay of the sound—offering unique tone to each player. But there was a price for this flexibility, several painstaking hours with a screwdriver or soldering iron and incredible patience was needed to change the sound of an electric piano. Suffer no more—with Lounge Lizard, the preset library provides a selection of thoroughly chosen configurations reproducing popular models so that you do not have to touch one knob before starting to play. The flexibility of the engine gives you access to all the physical parameters of the instrument allowing you to fine-tune every preset to your playing style. 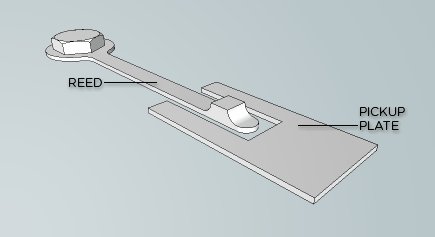 For example, adjust the position of the pickups using two simple controls: Distance and Symmetry. Or increase the stiffness of the mallet as you play, change the decay of the tone bar in real time, the choice is yours.